Mainly a B-movie actor, Billy Zane enjoyed a few brief moments in the sun most impressively for his supporting role as the villain Caledon Hockley in the historic blockbuster, “Titanic” (1997). The intense actor began his career playing an assortment of villains and oddballs in occasionally notable films like “Dead Calm” (1989) and “Orlando” (1993), but following a run of supporting roles in big budget Hollywood films and a not-so-well-received starring turn as “The Phantom” (1996), he took up residence in the realm of macho low-budget action films and sci-fi thrillers. A prolific working actor to say the least, Zane churned out numerous B-movies and cable telepics yearly, occasionally turning heads in acclaimed independent dramas like “The Believer” (2001) and John Sayles’ “Silver City” (2004), though his curious movie choices made it difficult for him to rise to the status of a solid Hollywood supporting player, for which he unquestionably had the looks and talent. Zane was born to Greek-American parents on Feb. 28, 1966, in Chicago Illinois. He became interested in acting when he was a child, making short films on a Super-8 camera and appearing in school musical productions. After enjoying a school year abroad in Switzerland and finishing up high school in Chicago, Zane moved to Los Angeles to break into acting. His first year in Hollywood he had the good fortune of landing bit parts in the classic “Back to the Future” (1985), “Critters” (1986) and the TV-movie “Brotherhood of Justice” (ABC, 1986). Zane’s breakthrough came as a result of his chilling performance as a psycho who terrorizes a couple aboard their yacht in Philip Noyce’s taut thriller, “Dead Calm” (1989). As a bonus, he met his wife Lisa Collins on the set, though her screen time was eventually cut. Zane followed up with an equally creepy performance as a serial killer in “The Case of the Hillside Stranglers” (NBC, 1989) and reprised his role as a high school thug in “Back to the Future II” (1989). In another Western, Zane had a supporting role as a traveling entertainer in the box office hit, “Tombstone” (1993) before snaring a starring role as a mysterious gardener in “Lake Consequence” (Showtime, 1993) and as an avenging cop in “Flashfire” (HBO, 1994). From a supporting role in the mainstream romantic comedy “Only You” (1994), he turned around to star in low budgeters “Silence of the Hams” (1994) and “Tales From the Crypt Presents Demon Knight” (1995). Returning to cable television, Zane was seen as an ex-con in “The Set-Up” (Showtime, 1995) followed by a co-starring role as a heroic environmentalist opposite Robert Downey, Jr. in the eco-thriller “Danger Zone” (1996). Zane’s leading role in Simon Wincer’s big budget adaptation of the comic, “The Phantom” (1996) was unfortunately a miss with audiences despite a large marketing campaign, but he received the most press he had up to that point in his portrayal of the purple bodysuit-sporting crime fighter operating from the fictional African country of Bengalla. Unfortunately, even fan-boy interest could not save the film – due in large part to it being a dated story with little following in the modern day comic book world. The disappointment of his first big Hollywood film was short-lived once he signed on for his next picture, though he could never have imagined the level of success and adulation the film and cast would experience when he first began production in Mexico in 1996. Although thought by industry insiders to be the biggest gamble in film history with the biggest budget, James Cameron’s “Titanic” (1997) quickly became a phenomenon – and for more than a decade, the highest grossing film of all time. The actor cemented his reputation for villainous characters with his role as Caledon Hockley, the wealthy, caddish fiancé of hesitant young society woman, Rose (Kate Winslet) – both of whom book passage on the doomed luxury liner. However, instead of playing his role of the spoiled son of privilege for straight evil, Zane embellished the character with touches of charm and humanity which resonated far more with audiences than if Hockley had been completely unsympathetic. Hockley does care for Rose and his pain is evident as he watches her fall in love with “gutter rat,” Jack Dawson (Leonardo DiCaprio). Though the arduous and dangerous shoot led by the tempestuous Cameron – which including filming the famed sinking on a close-to-scale version of a ship while lowering it into various water tanks – was a trying time for the actor, there was no doubt upon the film’s release and the hysteria surrounding it that Zane – along with Cameron, Winslet and DiCaprio – were cemented forever by association with a once-in-a-lifetime cinematic milestone. However, unlike DiCaprio, Zane’s association with the year’s Oscar-winning Best Picture did not rocket him to superstar status, and his next project was starring in and co-producing an unproduced script by late B-movie icon Ed Wood, “I Woke Up Early the Day I Died” (1998). He followed up his performance as a cross-dressing asylum inmate with John Landis’ little-seen dark comedy “Susan’s Plan” (1998) and made an unlikely segue over to Disney to voice “Pocahontas II: Journey to the New World” (1998). Darkly handsome and strapping, Zane was well-cast as Marc Anthony in the ABC miniseries “Cleopatra” (1999) which led to a string of television movies, including a miniseries adaptation of Dean Koontz’s “Sole Survivor” (Fox, 2000) in which Zane essayed a sympathetic role as a newspaper reporter investigating the mysterious death of his wife and daughter in a plane crash. He turned around to give a strong performance in “The Believer” (2001), a well-received indie drama about young neo-Nazis, and proved himself a strong leading man in the old-Hollywood style adventure “The Diamond of Jeru” (2001) for the USA Network. A string of low budget pictures and a guest stint on “Boston Public” (Fox, 2000-04) followed, with Zane returning to the producer’s chair for the Beat Generation-set “Starving, Hysterical, Naked” (2003). He remained in the low-budget/direct-to-video thriller realm until 200 when John Sayles cast him in his political satire, “Silver City” (2004) in a refreshingly accessible role as a land developer in cahoots with local crooked politicians. Zane next teamed with Michael Madsen in two features: the WWII heist “The Last Drop” (2005) and the multiple Golden Raspberry Award-nominated adaptation of the video game “BloodRayne” (2006). More preposterous B-movies followed, but at least the actor took a break from macho actioners and sci-fi to produce “Fishtale” (2007), in which he starred as a widower who falls in love with a mermaid, played by his then-fiancée Kelly Brook. He was back to gun-slinging until taking a break from violence with his role as an average suburban workaholic whose fiancée (Amy Smart) dreams of a professional dance career in “Love ‘n Dancing” (2009). Zane remained rooted in more realistic fare with his portrayal of the manager of an up-and-coming pop singer (Ciara) in “Mama I Want to Sing” (2009) and the family adventure film “The Gold Retrievers” (2009). However Zane returned to cheapie thrillers with “Magic Man” and “Surviving Evil” that same year. Like many of his fellow big screen actors dying for quality parts, Zane shifted his focus to the small screen, appearing as Cliff Huddle, the pathological narcissist known as the “Prince of Darkness” who serves as managing partner at the Sterling law firm filled with equally gorgeous young attorneys on ABC’s drama series, “The Deep End” (2010- ). Do you want to hire Billy Zane? Directly request a quote. In 48 hours we can send you the availability of Billy Zane If you would like to book Billy Zane, Entertainment Booking Agency is the right place. 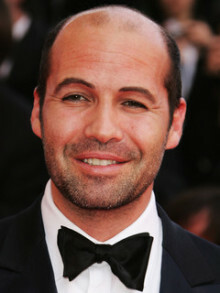 We will offer you the best price and contact the management or we directly contact Billy Zane. For corporate appearances or speaking engagements you can contact our agents and the will help you true the process. Tags: hire Billy Zane, Billy Zane booking, book Billy Zane, Billy Zane appearances, find more information on booking Billy Zane for appearances, Billy Zane speaking engagements, Billy Zane endorsements/spokesperson, Billy Zane appearance fees, Billy Zane booking agency contact info, biography of Billy Zane, Contact an artist booking talent agent find a speakers bureau that can book Billy Zane, speaker booking agency for Billy Zane, Billy Zane booking agency, Billy Zane booking for corporate event. EBA is one of the biggest entertainment booking agencies in the World. We book hundreds of celebrities, artist, athletes and speakers in a year. Important to know is that we are not claiming to be the management of Billy Zane. We are not the official agent for Billy Zane. Companies from around the globe book these artists and speakers true our company be course we have one of the biggest networks and we always have direct contact with the artist or the management. We help you to find the right celebrities for your corporate of private events. Please contact one of our agents to get free advice and we will help to get the world-famous artist on your party.